Whats app is a part of our social life. We share everything on whats app. We wish, greet our loving one on whats app. 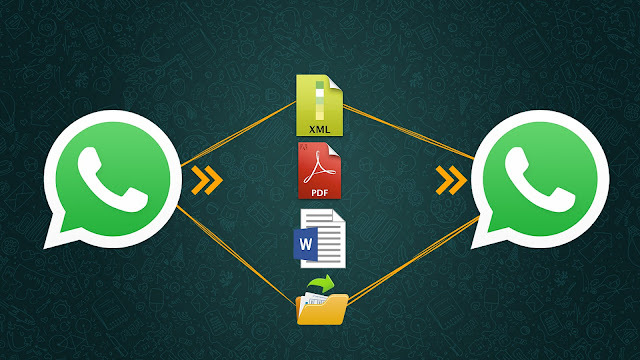 Send and share pdf, doc, excel, Xls files in Whatsapp and whatsapp web. In Whatsapp we often send and share audios, videos, contacts,contact details, location, photos from gallery and cameras directly from top right icon with our near and dear ones easily. But in some cases we need to send pdf, doc, excel and Xls files to our contacts. But for that purpose there is no direct option available in WhatsApp. In order to deal this situation, there are many apps available in the app store. Whatsapp Tools,CloudSend and many Software Are available in the market. but i am tell you free and easy tricks to fast ending the file to destination. The solution to all the problems discussed earlier is whatsapptool. You can use this app for sending any type of files. 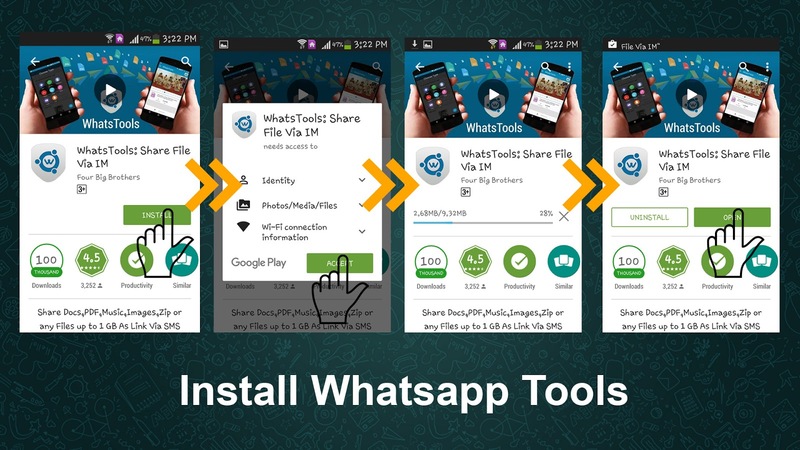 The name of this app is Whatsapp Tool App. This app will counter all the above problems. Before using whatsapp tool you will need a Gmail account. This app using Google drive as an intermediator to send your files. If you have a gmail account then you can use it but if you don’t have one then first of all you have to create one. This app allow you to send pdf, audio, zip files on whatapp. Step 1: Download Whatsapp Tool from Play store. 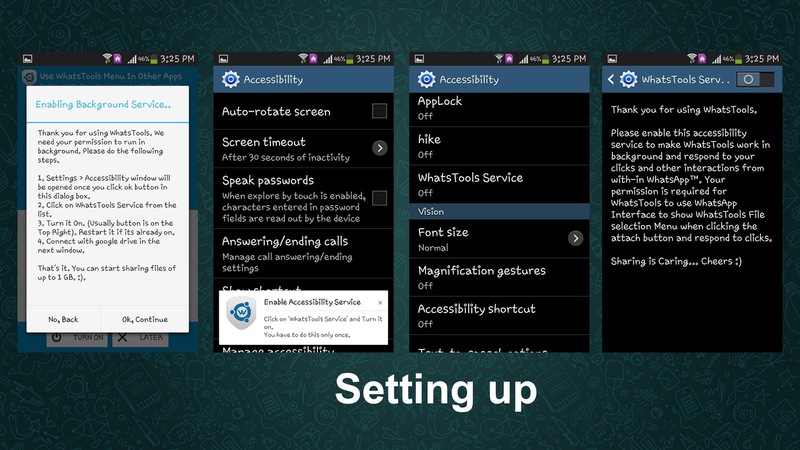 Step 2: Tap on Whatsapp tools icon in your phone and tap on Setup and you will be automatically directed to settings page. Step 3: Finally select the any type of file and click send the file to destination .shown below . 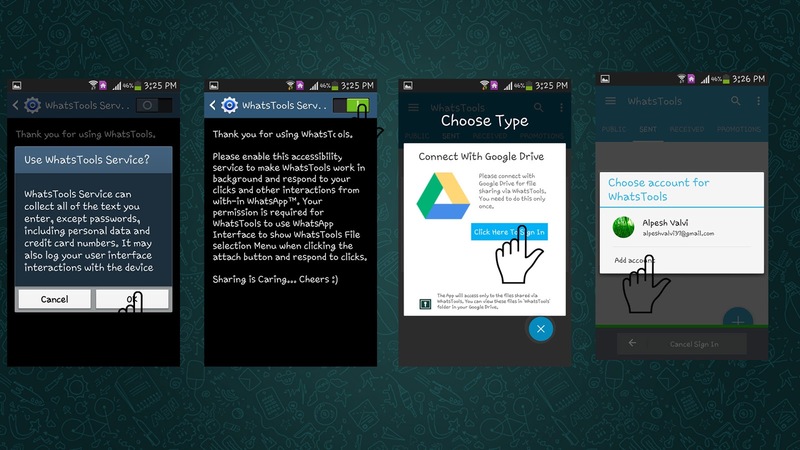 I hope now you will send all type of files on WhatsApp easily. Now we know that Whats cannot fulfill all requirements and scenarios. We need to use some other apps when whats app is not working out our problem. We have hope that now your problem i.e. 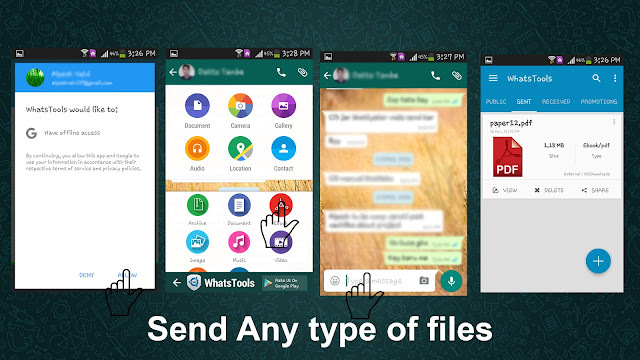 how to send pdf file, big audio, big video files, Zip files using whatsapp Tool app. So this is the simple way you can use to send any file on whatsapp of any size.